I did some mending in the afternoon. The children got home with their apples about four oclock. Hatt was sick and went right to bed. Mr & Mrs Osmond called this afternoon. John Whetstone was here in the evening. Friday November 15th 1878 Hatt did not sit up today. I cleaned the house all up nice this forenoon and baked two cakes. Win was over in the morning. I did a little sewing in the afternoon. Mrs Holt called here. The boys went to Mollies party tonight. I did not want to go when Hatt was so sick. I knit all the eve. 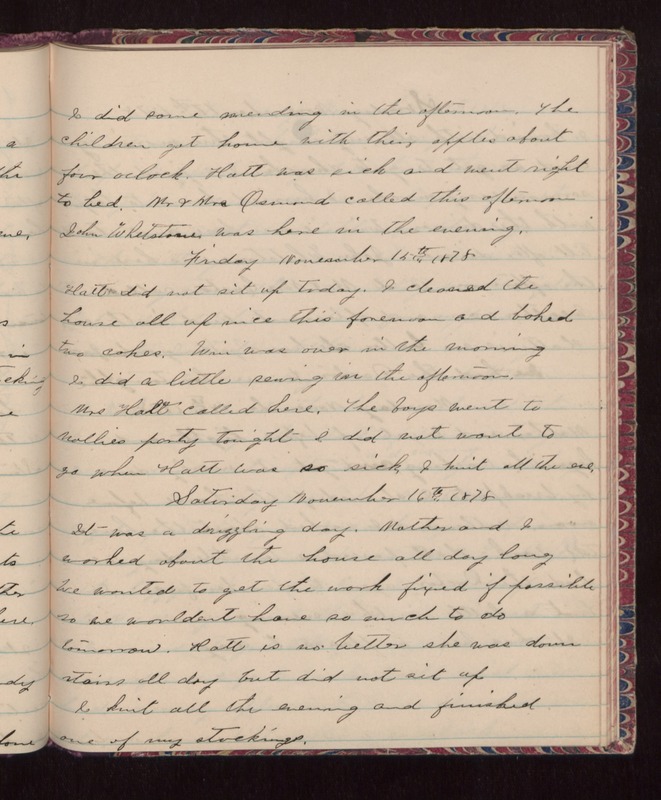 Saturday November 16th 1878 It was a drizzling day. Mother and I worked about the house all day long. We wanted to get the work fixed if possible so we wouldent have so much to do tomorrow. Hatt is no better she was down stairs all day but did not sit up. I knit all the evening and finished one of my stockings.